The Heavy Hitch Bucket Tooth Bar is the heavy duty tool you need to increase your bucket capacity and improve digging performance. Clamp on tooth bar installs simply with 5/8 set screws in each tooth shank. All you need is a 5/16 Allen wrench to install. Compatible with several front end loader, skid steer and tractor models. 49, 53 and 61 buckets on John Deere models 45, 120R, H120, D120, H130, D160, H160, H165, 200CX and 300CX front end loader buckets. 57 bucket on John Deere 220R model loaders with standard or heavy duty material bucket. 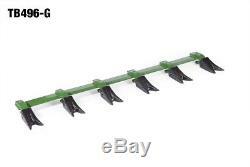 John Deere heavy duty 61 and 73 toothbar also available. If your cutter edge has holes running horizontally across it, the 61 or 73 HD is the model you would want. 46 on Kubota LA243 series loaders with 46.5 standard material bucket. 58 for the Kubota 60 buckets. Comes standard with a super durable finish in your choice of. Select color and size when ordering. All Heavy Hitch products are made in the USA by a Minnesota company you can trust. Be confident in the quality and longevity of our products we use only American made steel and certified welders. Heavy Hitch Bucket Tooth Bar Details. Features heavy duty Pengo 230 shanks (with inch cup-point set screw); 6 shanks on the 46 and 49; 7 on the 53, 57 and 61; 8 on the 73 toothbar. Teeth are replaceable and interchangeable. Installation is easy no drilling required. Simply slide on and tighten set screws to 35-40 foot pounds using a 5/16 Allen wrench. Works with standard material buckets with up to a 1/2 cutter bar. Smooth design prevents mud and debris from hanging on. Custom bucket tooth bar options are available for other size buckets and cutting edges. Will not work with a heavy duty bucket and ¾ cutter bar. The item "Bucket Tooth Bar, Clamp On for Sub-Compact Tractor No Drilling Required" is in sale since Monday, August 6, 2018. This item is in the category "Home & Garden\Other Home & Garden". 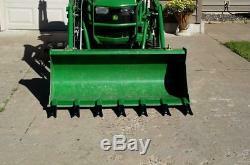 The seller is "heavyhitch" and is located in Winona, Minnesota. This item can be shipped to United States, Canada, United Kingdom, Denmark, Romania, Slovakia, Bulgaria, Czech republic, Finland, Hungary, Latvia, Lithuania, Malta, Estonia, Australia, Greece, Portugal, Cyprus, Slovenia, Japan, Sweden, South Korea, Indonesia, Taiwan, South africa, Thailand, Belgium, France, Hong Kong, Ireland, Netherlands, Poland, Spain, Italy, Germany, Austria, Israel, Mexico, New Zealand, Philippines, Singapore, Switzerland, Norway, Saudi arabia, Ukraine, United arab emirates, Qatar, Kuwait, Bahrain, Croatia, Malaysia, Brazil, Chile, Colombia, Costa rica, Panama, Trinidad and tobago, Guatemala, Honduras, Jamaica, Bahamas, Viet nam, Uruguay, China, Antigua and barbuda, Aruba, Belize, Dominica, Grenada, Saint lucia, Barbados, Bermuda, Brunei darussalam, Ecuador, Egypt, Gibraltar, Guadeloupe, Iceland, Jordan, Cambodia, Cayman islands, Sri lanka, Luxembourg, Nicaragua, Oman, Peru, Paraguay.